How Self-Diagnosis can lead you down the wrong path. Ah...Self-Diagnosis. Are you one of us that checks the internet when you’re getting sick or have a new symptom that worries you? Did you know the that the National Institutes of Health reports that one-third of all adults in the United States self-diagnose? This means almost 80 million of us every day goes to the computer to research a new symptom or problem that we or a family member has. Self-diagnosis takes place when patients search the internet for answers to health problems, makes a diagnosis by themselves, and more importantly, sets out on a course of action to fix or treat their “new disease”. Being convinced that you now have a new disease can lead to unnecessary anxiety and can hit you at a very bad time if you are worried and vulnerable. Where's the best place to get advice? Why can this be a bad thing? Isn’t the internet full of free information? And if you’re a good researcher, can’t you get to the bottom of what might be ailing you? One of every 20 Google searches involve health information. 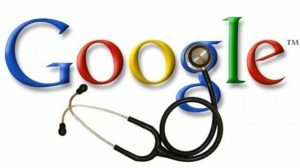 Bad medical advice has become so bad that Google has stepped in to try and help give correct health information. They now have a list of reputable sites to access. See below for some good choices of where to get good reliable information. The internet can be full of bogus health information. Everybody on the internet has an opinion, usually on everything. Have you ever seen so many “experts”? 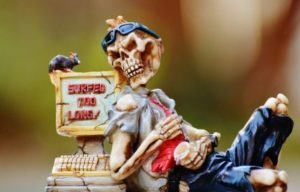 Information gleaned from the internet should be taken with a grain of salt, and beware of people trying to sell you anything. Unfortunately, we as human beings tend to fixate on the worst-case scenario when it comes to our own health. A cough can become cancer, and a simple headache is now a brain tumor. 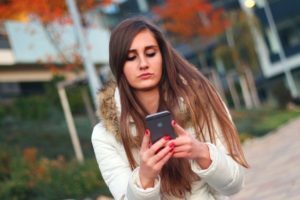 Many patients do use the internet to research their condition before coming to a doctor’s office, but it is easy to get led down the wrong path. The internet can also contain good medical information. We use the internet every day to send patients to reliable websites like the Center for Disease Control (CDC.gov) or medical university educational sites. The best place to search for medical information is at the medical schools, insurance companies and government agencies. Medical sites that you can trust always tell you that the information that you read here is for Educational Purposes Only. It’s never a substitute for seeing your family doctor to find out what really may be going on. 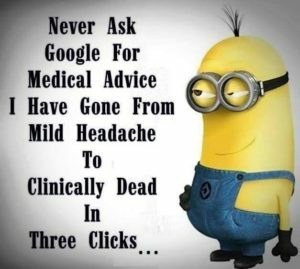 Google is doing it's best to educate us with reliable medical information, but you need to be careful of where advice comes from. Any of this information hitting home with you? Do you have a new symptom or health problem that you would like to discuss with a doctor who really cares? Call our office now and make an appointment. Do you spend a lot of time researching your health or have an interesting story about this topic? Leave a comment or question below. This entry was posted in Blog and tagged diagnosis, family doctor, Google, medical advice, self-diagnosis, women's health. Bookmark the permalink. ← Oh No… I have Mono!